Bramley is a heavy cropper once established with high quality fruits that can be stored. Grow Bramley alongside another apple variety such as Braeburn for best fruit set, as self-fertile. Supplied as a 1.2-1.4M tall, grower quality, multi-branched bare root tree. Grown on a dwarfing root stock. Will grow to approx. 2m (6-7 ft) in 10 years. Fully winter hardy. Considered 'The King Of Cooking Apples' by respected chefs and professional fruit growers, 'Bramley' was raised from a single seed planted by Mary Ann Brailsford in 1809. Since then it has gone on to become the worlds best known and favourite cooking apple, standing the test of time through over 200 years! It is considered supreme because its fruits have the perfect acidic flavour required for use in the kitchen and the almost pure-white flesh becomes incredibly light and fluffy when cooked. 'Bramley' is an incredibly heavy cropper once established with high quality fruits that will store through the winter months pick them in early October (before they get over-ripe) and store cold but frost free for use until January. Our grower quality multi-branched bare-root trees have been grafted on to a dwarfing rootstock to provide a compact and manageable habit which in this case will reach about 2m (6-7 ft) tall. 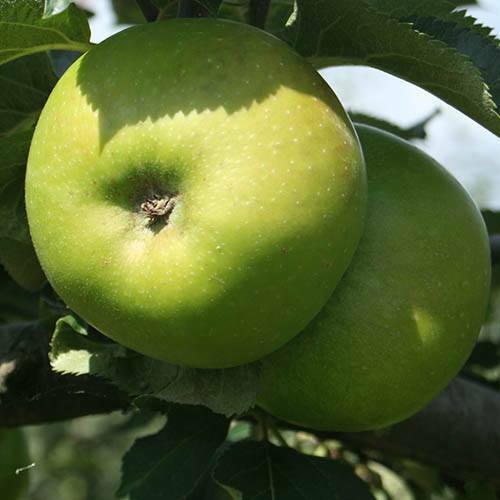 It is best to grow 'Bramley' alongside another apple variety such as 'Braeburn' for best fruit set, as 'Bramley' is not self-fertile. Take a generous handful of sultanas and soak overnight in Whisky with a dash of cloves added. Take the apples and core them, also make a cut just through the skin around the circumference to prevent the apples splitting, place on an Ovenproof Dish. Stuff the core cavity with the sultanas and then add sugar to the remaining spirit to make a thick syrup (consistency of Honey) and drizzle over the top of the apples. Then bake at 180 degrees for about 35-40 mins and then serve up with Cream or Ice Cream and enjoy the fruits of the garden! Supplied as a 1.2m tall, grower quality, multi-branched tree. Grown on M26 warfing root stock.